We are in full Autumn swing here at Hookin’ on Hump Day! I am so glad you are joining us again! 1. MOST CLICKED LINK: Fall-In Love (Infinity) Scarf by Crochet For You– “Fall In Love” with this unisex scarf pattern … wrap it, twist it, or drape it around your neck! It’s a FREE crochet pattern too! 2. Estrellas en el Mar, Manta para Bebé / Stars on the Sea Baby Blanket by Arrorró en colores – Gorgeous (and FREE!) baby blanket crochet pattern available in both Spanish and English! 3. Bella Bricks Fingerless Mitts by My Hobby is Crochet – These fingerless mitts are comfy, stretchy, and will keep you warm … FREE crochet pattern! 4. Granite and Marble Cowl by Creative Designs by Sheila Zachariae – Chunky, cozy, and chic … perfect pattern for the beginner knitter too! 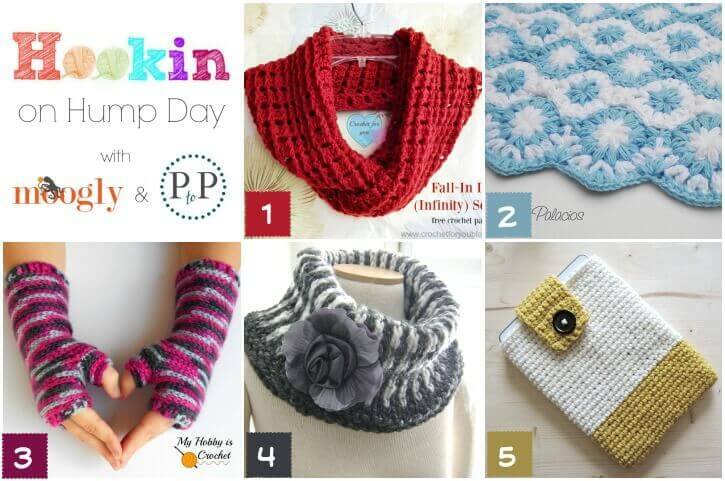 Includes link to PAID knit pattern. 5. Crochet Cover for any Tablet or Phone by Ahooka ‘migurumi – Make your own custom case for your tablet or phone with this FREE pattern and video tutorial! time to get your yarn fix! woot! I am totally confused. I thought that the directions were free, but when I click on #2 it comes up in Spanish, then when I click on English, it has a $5 fee. Am I missing something or doing it wrong? Hi Maria, the pattern has two versions: a free chart pattern on Ravelry and paid fototutorial on Etsy and Craftsy. The post contains the three links. Thanks! I’m a bit early so I’ll pop back again later. I do love that cowl from the last party. Ohh, more party guests! Time to mingle.